These maps show locations of forest harvests on crown lands planned or conducted since September 30, 2014. When a new allocation is made, an Allocation Map is posted and is open for comment for 20 days. You can subscribe to receive notification of new allocations. A Map Viewer launched in the spring of 2016 shows allocations for the whole province, and replaces the pdf-based harvest operation maps that the DNR launched in 2014. Unfortunately, there is no equivalent for private lands, which reflects the lack of any significant regulation or monitoring of cutting on private lands in Nova Scotia. Once posted, the comment period is open for 40 days. Note: Existing Parks and Protected Areas can be viewed as a layer on this map but not areas proposed that have not yet been protected. See Interactive map of Parks and Protected Areas (also listed below) to view those areas. Currently (Apr 3, 2018) this provides Wind Exposure 2017; and FEC Soil Type Layers. Convenient for viewing Crown lands, Protected Areas, Ecological land Classification and a lot more. This is a key tool for keeping track of forest management history, extent etc. It takes a while or quite a while to figure it out (at least it did for me; ongoing!). See Codes. Some of the codes I was able to find only in a Photo Interpretation Specifications. A spatial dataset of all Crown lands in Nova Scotia. Zoom in your view of the map to locate the map that you wish to view. Each map has a name – usually the name of the largest town on that particular map. – To download the map that you want — go to the top right of the page. There is a box that says “ONE MAP”. Click on that box. Now, go to the map square that you wish to download. Click on that map. You should see a little pop-up on the screen now — it will say “Map Name”, and “Sheet No” and a button saying DOWNLOAD. Click on that button. The map should now be downloaded to your computer — and will be wherever your downloads go. – To view your download, you go to the download file and you’ll see that there a .zip file of the map. The file will have a name something like “DNRZO8QzVhNpdf.zip. You should be able to click on that file and it will expand and reveal another file inside which is a .pdf file of the map. – Once you have the file up on your computer, look for areas surrounded by a GREEN border. Areas surrounded by GREEN over top of a dot-and-dash black line are Crown lands. Those surrounded by GREEN over a solid black line are Provincial Parks and Wilderness Areas. There are other designations as well (National Parks, etc). Look at the KEY at the bottom of the map to help understand the designation of various tracts. – One further thing that you can do with these maps is to find out the general make-up of the trees — at least based on data collected in the past. I’m not going to get into this part of the map too much beyond mentioning that there are lists of CODES down at the bottom of the map. They can be used to see what kind of land designation a tract has been given — for example OF is “Old Field” – retired farmland. – There are CODES for Tree species – Softwoods and Hardwoods are listed separately. At the bottom right of the map is a diagram explaining how to use the CODES to read the description of the forest on the tract of land you are viewing. – I hope all of that will be of help to those who wish to see what Crown land forests may be in your area. I think these are older maps, not updated. I believe the same info can be found on the Nova Scotia Landscape Viewer, however the PDF maps be more convenient for some purposes. Gives secondary watersheds, limnological data for lakes. Nova Scotia Environment Water Strategy More maps available on that page. Interactive; map shows changes in forest cover associated with fire, infrastructure, harvest and in an “Untyped” category for all of Canada over the interval 1985 to 2011. See example on this website. 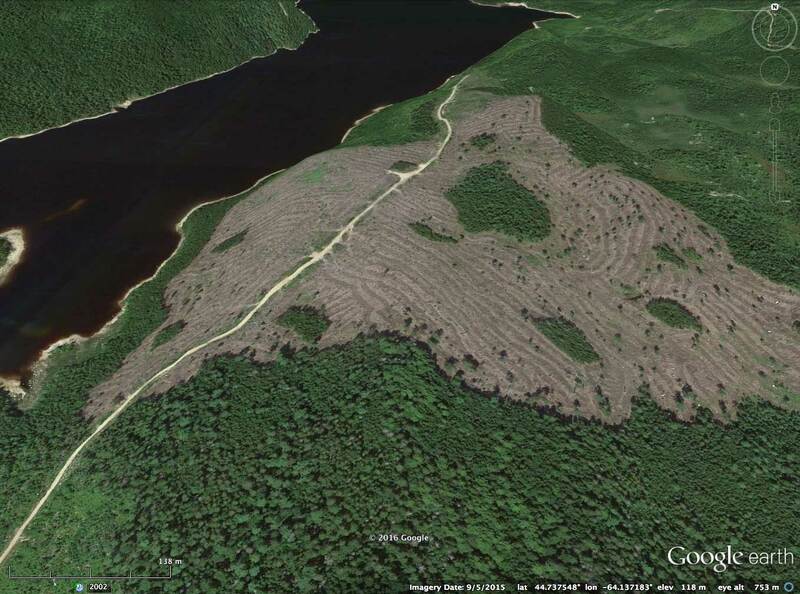 Clearcutting near Halifax revealed by Global Forest Watch Images. “Timelapse is a global, zoomable video that lets you see how the Earth has changed over the past 32 years. It is made from 33 cloud-free annual mosaics, one for each year from 1984 to 2016, which are made interactively explorable by Carnegie Mellon University CREATE Lab’s Time Machine library, a technology for creating and viewing zoomable and pannable timelapses over space and time. Thx to NW for pointing this one out. Not as sharp (not as high res) as what you get from the Global Forest Watch Interactive Map, but this one covers more years. Very easy to use. Powerful interactive map tool showing satellite images over short intervals; useful for tracking road-building, harvests etc. “Making government data easier to access for individuals, businesses, and researchers”. Unfortunately, it “doesn’t work” for most people without some specialized training and access to GIS software. See Linda Pannozzo on The case of the disappearing forest age class datain relation to the Forest Inventory file. The Photo Interpretation Specifications document provides some important info./definitions. NFIS is “Canada’s National Forest Information System“, set up to “answer questions on matters relating to sustainable forest management in Canada.” This interactive mapcshows Forest Cover (Mixed, Coniferous, Hardwood), with options for other layers (parks,roads, rivers etc). Easy to use. Also shows the Ecological land Classification regions/Districts/Sections. Steen Magnussen and Glenda Russo 2012, The Forestry Chronicle 88: 439-447. “Canada’s National Forest Inventory (NFI) relies on photo-interpreted forest resource data provided by provincial and territorial agencies. NFI data are collected at regular intervals in time from a nominal 20 × 20 km network of 2 × 2 km photoplots. Attribute-specific NFI estimates of precision include contributions from sampling errors and uncertainty in the source data. We assessed this uncertainty in NFI photo-interpreted forest attribute data from New Brunswick and Nova Scotia…estimates of precision were inflated by an average of 7% (range 0%–36%) due to the uncertainty in the source data. Species misclassification and age determination were the largest sources of uncertainty.